Cherev Gidon Israeli Tactical Defense Academy, an academy which teaches students how to use firearms among other forms of self-defense, has received unprecedented levels of enrollment and interest from Jews throughout Pennsylvania following the massacre of eleven Jews in the Tree of Life Synagogue in Pittsburgh this past Shabbos. The status of the enrollment spike was first reported by Reuters, according to whom, hundreds of people have contacted the center since Sunday. Stern, served int he Netzach Yehuda infantry battalion while he was in the IDF. He is a resident of Kiryat Araba in Israel but has lived in the United State for more than a decade now. He opened the training academy to help teach American Jews how to use weapons and other forms of self-defense. The academy has been around for six years and is located near Scranton. “I was involved in a lot of combat instances, a lot of gun battles. I saw a lot of action, a lot of people being shot, people being killed, and that’s something that really motivated me to train others to protect themselves because I really don’t want to see anyone being a victim,” he explained. “For years we have been telling American Jews that they need to get armed and trained to defend their communities against violent anti-Semitic attacks. Many listened to us, but sadly many others preferred to bury their heads in the sand and ignore our warnings. Today, our predictions came true right here in our own state of Pennsylvania and too many have had to pay the ultimate price. 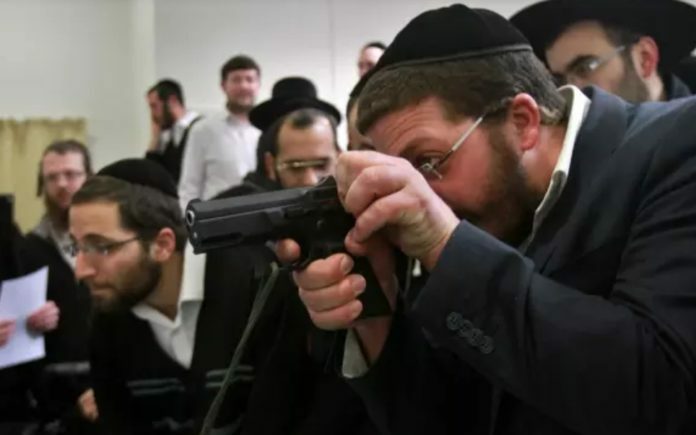 Do not ignore the writing on the wall: Buy a gun, learn how to use it, and carry everywhere you go, especially to Synagogue,” he concluded.